I can't even bring myself to copy and paste the list in here. It's just too depressing. I am only posting this so you don't worry that I've dropped dead or something - no, I am still alive, just spectacularly busy. Today I reckon I have marked for about 8 hours. With hindsight, perhaps it was a bad idea to pick up monthly goals again when I have been away for two weekends of the four and up to my eyes in exam board duties when I do make it home. I fear Mr Z has forgotten what I look like. Onto business. I HAVE finished the shawl - I owe a blog post.I need to take some good pictures first, though. I have ALMOST finished the pink linen top - I need to do some kind of mystical crochet to it before I can pick up and knit around the bottom edge, so that I don't run out of yarn. Impressed that I've managed to get almost the whole top out of the one cone of linen. I haven't blogged, or cast on, or cleaned, or tidied. As for the last three worky things - they are in progress and nearly done. I miss my life this month! Can't wait for July 13th, which I have pinpointed as the ultimate day off. No work, of any description, and nothing else to do. Bliss. Hopefully I will manage to blog though. I'll never make it to 127 posts this year if I put up such a pathetic showing every month. It's been a while, but I always come back to it! June is going to be BUSY. I am excited but I need to be on my game. 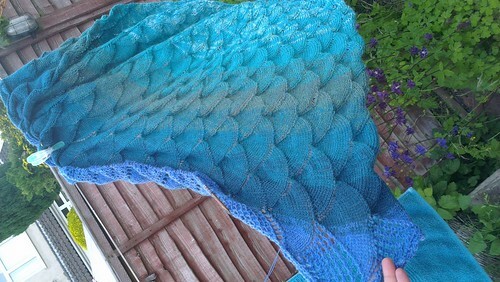 Finish knitting blue shawl of joy (8 border rows + 18 edging points left to work). Finish knitting pink linen camisole (just the back left to do). Dust and tidy dressing table and side table. Get rid of/file magazines next to bed. Write action plan for school techie project. Plan and record online assembly for techie day at school at end of month. Plan session for history conference in July. I feel like there are more things that need adding to this list but it does seem to be getting very long and I might have to leave it at that. Also most of the other things are work related and I am not disposed to give them any more of my time than is necessary at this point.